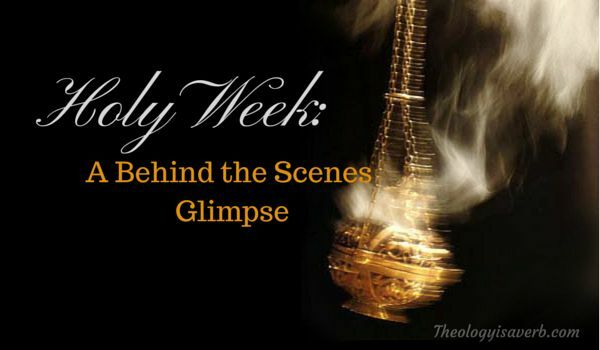 The sights, sounds and scents of Holy Week that so permeate our remembrance of Easter are indeed rooted in centuries of tradition. One look around and one immediately sees layers of history and meaning in every ritual movement, prayers embedded within the hearts of a people of faith. From the swish of the robes, to the smell of frankincense and lilies, and the lofty notes of the Exsultet sung we are drawn into the sacredness of this moment in time. More than a sign, these symbols call us to look beyond the object itself to something deeper, more meaningful, and often mysterious to be truly experienced in this same multi-layered way. Was there one special moment that stood out for you? Did you feel the invitation to connect, to go deeper and answer God with the fullness of your heart? After countless Triduum masses, I have found that only rarely is the answer ever the same. That is the beauty of opening yourself up to the experience of the mysteries of Holy Week again and again. Personally, I never tire of hearing the profound impressions and recollections that are taken forth from a mass. Or even the silent expression of joy or love that rests of the faces of those in attendance as they leave the doors of the church. This all happens in spite of our best efforts, our missteps and last minute adjustments made in the course of preparation of the mass. God perfects and works through all of our faults to reach out to each person gathered in community. If but for an instant, I am certain of the unworthiness of my own efforts I am also reminded of the One far greater than myself. For that I am so truly thankful! With that being said..those that serve for these masses carry with them the stories of errors and omissions and how God worked through all for good. One such year, due to windy weather, the option to light the Pascal fire indoors was made. Needless to say, the addition of extra isopropyl alcohol was a perfect mix to set off the silent smoke alarms, thereby alerting the fire department. The dark church, gathered for Easter Vigil, was filled with swirling red lights, and the entrance of several concerned firemen. All this unbeknownst to our beloved priest who was enthralled in singing the Exsultet and had his back to the congregation. None noted that evening that this detracted from the mass, but had in fact added to the sense of community already present. I thought of this story as we were waiting to make the call for the fire at this year’s Easter Vigil with the promise of high winds throughout the day. Though this concern was averted, just minutes before the start of mass we found ourselves furiously working to put together more individual votive candles. The box of holders, placed near the ceiling could only be reached with the hook of the snuffer and the long arm of the priest…while standing on the counter top! 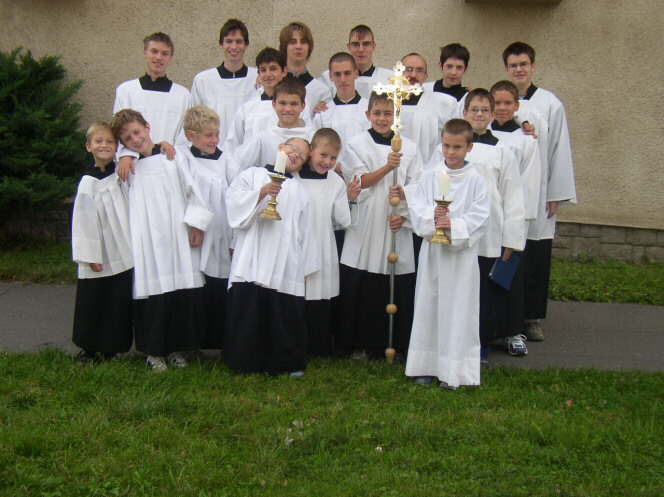 With God’s presence as the only guarantee- through the years, I have determined these are my top 5 tips for altar servers. In serving, it’s all about what God does in the celebration of the mass. Work as if to blend into the scene. Be well rested, fed, on time, and joyful. There is a significant need for ponytail holders. Why? Because, girls, the overabundance of candles present at Holy Week and long hair do not mix well. 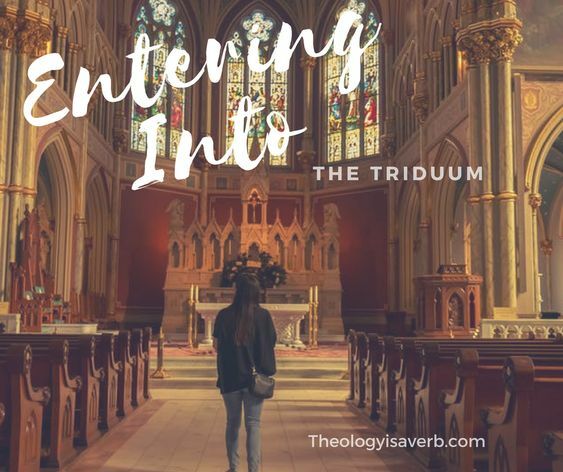 Thurifers: Do not rest the thurible on the carpet or under the hem of the your robe. There is no need for a new martyr of the faith due to complacency. Do your best and give God the rest. Rather than becoming anxious over what you did or failed to do, let God work through it. Sing and pray- You are there to serve but it’s important that you too recognize the invitation to participate and pause for God’s voice. “A pessimism of life is not Christian. It is rooted in not knowing that you are forgiven, it is rooted in not feeling the caress of God. And the Gospel, we may say, shows us this joy.” We must make “every effort to show that we believe we are redeemed, that the Lord has forgiven us everything.” Pope Francis, general audience, 12/21/17. During Lent, as Catholics, we often speak of things given up or challenges taken on all with the intention of growing closer to God. Even the smallest thing can subtly secure a place of importance in our lives, usurping family, friends, and even Christ as the center of our lives. And at some point in our faith, each of us has felt this pull away from temptation and sin, towards God’s limitless love and mercy. Yet once aware and received, do we live it… do we live our life knowing that we are redeemed? The first part to this you see is knowing that we are a people forgiven. Even before we speak of it, that our sin is known, but also ready to be pardoned. That though there is nothing that we can do to earn God’s grace, that it is there in anticipation -already won by Christ’s victory on the cross. Yet, part of the difficulty lies in our own struggle with forgiveness including that of forgiving ourselves. We hold onto our fears, faults and limitations and then place those upon God. Nevertheless, our God is a promise keeper and not bound by our human imaginations always ready to welcome us home. Several years ago, I had an unexpected but similar conversation with a man then in his 50s who had stopped into Starbucks for a coffee. Noticing my t-shirt which sported one word forgiven, with forgive highlighted, he had felt compelled to ask the question. “Pardon me, but I could not help but notice your t-shirt..What is it that you could ever have to be forgiven for?” Oh, what a conversation starter that turned out to be! Our children more easily understand what we, as adults, have made such a formidable challenge- that we are unconditionally loved. They come to us with penitent hearts and tears but with a certain assurance too that they will be forgiven. And just as soon as they are, the sadness is replaced with joy and they are free to embrace the day and one another. With Easter upon us, let us live today with that same joy, and trust in God’s mercy, as a people redeemed, reclaimed and loved. This Lent, our Catholic collaborative parishes will once again host a Tenebrae service of worship. 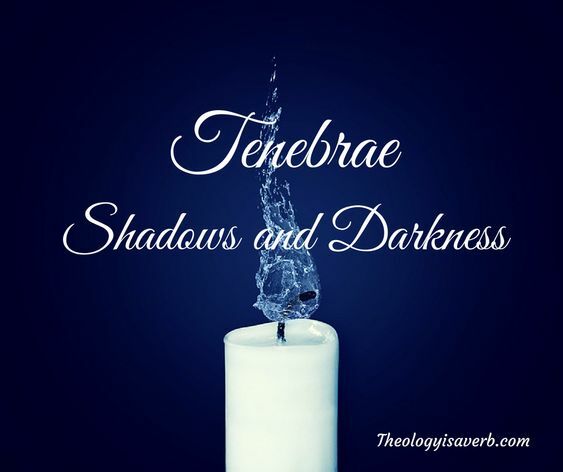 Latin for darkness or shadows, Tenebrae invites us to prayerfully reflect on Christ’s pain and suffering the day of His crucifixion through both music and readings. One of the most conspicuous features of the Tenebrae service is the gradual extinguishing of candles as well as the pauses for silent prayer. In contrast to the celebration of Easter, the mournful tone of Tenebrae enables us to enter into the reason for our hope and joy through these expressions of grief. The service is typically divided into eight parts, an Evening Office prayer and seven Day Offices or prayers: Lauds, Prime, Terce, Sext, None, Vespers and Compline. The first part consists of three nocturns each composed of 3 psalms with responses and three lessons, which are taken either from scripture or from the Church Fathers. The second part has 5 psalms, verse and response, a Benedictus song reflecting on the birth of John the Baptist and a Pater reflection on the death of our Lord. This dramatic service even includes a loud noise to indicate the earthquake that occurred when Christ died. After each of these sections of psalms and prayers a candle is extinguished until the church is left in relative darkness and silence. It is an intentional glance forward as we begin our journey through the liturgical celebrations for Holy Thursday and Good Friday culminating in the joyful celebration of the Resurrection of our Lord and Savior. 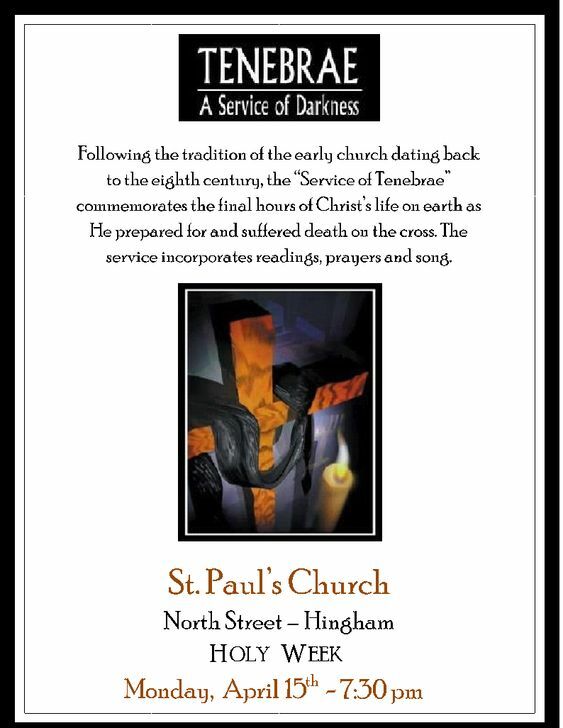 Please accept this as your invitation to join us tonight or participate in a Tenebrae service near you if you are able. May God bless you all in this most sacred of weeks!